Most of you reading this are already at your limit with animals that you are caring for, yet we are inundated every day with homeless animals (whether you see them at your rescue/shelter or all over Facebook). It seems as though we can never do enough. Well, today I am going to CHALLENGE you to do something that would give an animal a new “leash” on life. This might not be an option at every shelter or rescue, but the idea behind this is that we can maybe bring some attention to those less adoptable animals in the shelter. I was sitting at home last night, looking at all of the animals in need and I knew that I had to do something. Later on this week, I will reveal that animals that I have chosen for this challenge, but I can tell you right now that they are all black labs that are easily overlooked within the shelter system. When making your choice, pick an animal that might be overlooked– a senior, a certain breed, a special needs animal– some precious soul that might just need a chance. The idea behind this is that the shelter or rescue will be “on board” with this, will promote the animal as having a sponsored fee, and this might arouse the attention of a family. ALL REGULAR APPLICATION PROCESSES WOULD STILL APPLY. This is by no means giving an animal a home for “free”, just another way of donating to the shelter and connecting with an animal at the same time. Shelters and rescues have very reasonable rates, but sponsoring an animal would bring it out of the shadows and into the limelight. Once you have chosen your animal and have sponsored the adoption fee, please post the link on our facebook page and we will share the animal AND the rescue/shelter with our fans. 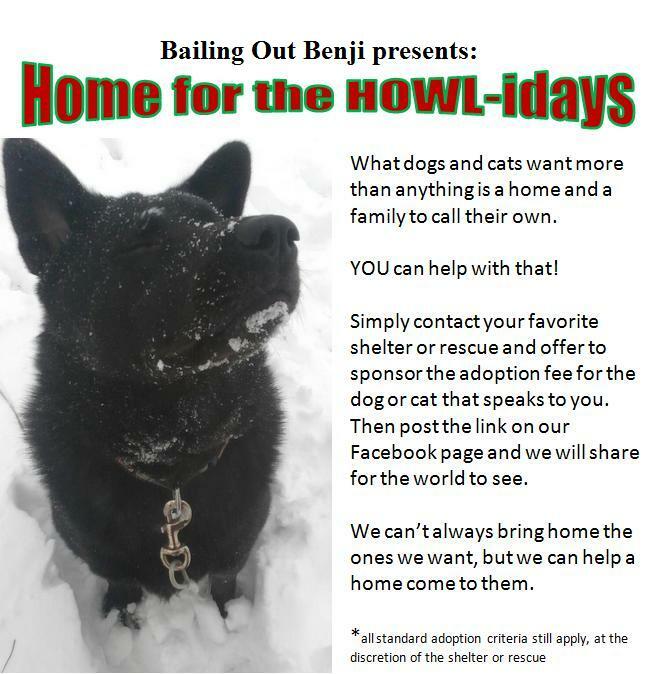 If you are on Facebook or Twitter please share #HomeForTheHOWLidays with your friends/family/coworkers. You never know how many success tails might come of this.